At the Dolman Law Group in Boca Raton, Florida, we are fully prepared to help you fight to achieve justice for virtually any civil legal matter affecting your life, your livelihood and your future. To that end, our law firm's team of experienced, award-winning attorneys provide exceptional advocacy and support to innocent accident victims and their families adversely affected by someone else's negligence or wrongdoing. In addition to handling all types of personal injury, medical malpractice and wrongful death claims, our law firm also offers unmatched representation in many other legal areas such as employment law, unfair debt collection practices, workers' compensation and more, and we are totally committed to protecting your rights and entitlements, and helping you achieve the favorable outcomes you expect and deserve. Recognized for our success and our impeccable professionalism, we have earned numerous awards and honors throughout our careers, including national recognition as being among the top trial advocates in the country. What's more, the American Institute of Personal Injury Attorneys voted us as one of the 10 Best Law Firms for Client Satisfaction, so you can trust that we will attend to your matter promptly and help you secure a brighter future for yourself and your family no matter how dire your situation. 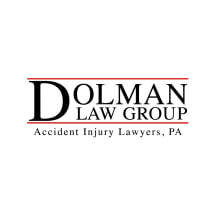 To find out more about how the Dolman Law Group can best help you through your difficult and uncertain time, you can contact our law office or visit our website to schedule a free initial consultation.